Chigiri-e is a traditional technique of picture making, known in Japan (and also China) for more than one thousand years. The artist Paddy Summerfield has been using the Chigiri-e technique in her work for the last ten years. On this site you will find more information on the Chigiri-e technique with examples taken from Paddy Summerfields pictures. Click on the pictures to see larger examples. 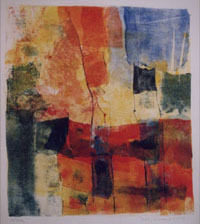 Certain regions of Japan have specialised in the production of papers and the board supports used by chigiri-e artists. In Japan, in the Heian period (794-1185), chigiri-e was used in conjunction with calligraphy; poems were written on a background of either plain or decorated coloured paper (see the textual passages of the Genji scrolls). In the 11th century calligraphy paper was usually white or light blue; it could be decorated and coloured and then mounted onto a support. 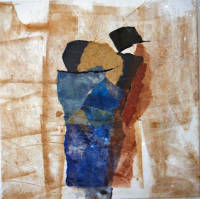 Chigiri-e is, in effect, collage using torn paper, of various textures and transparency, superimposed one on the other. Traditionally Heian calligraphy backgrounds incorporated Chinese patterns and themes and often used woodblock techniques to achieve them (grasses, bamboo, water, flowers). These themes are still used. "Collage attained unparalleled splendour where sheets torn or cut on the diagonal formed colourful designs. Some were further decorated with colour pigments or metallic dust. This provided the under drawing for aristocratic calligraphy." (J.S. Baker, Japanese Art, Thames & Hudson 1984, 2000). 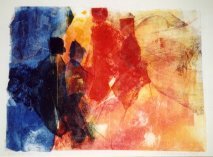 Traditionally the papers are dyed but I use etched plates and the etching press to colour the paper, either using etching inks or mixing my own colours from powder pigments. The combination of texture and transparency results in a characteristic richness of colour. 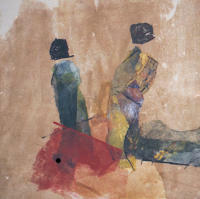 In many collage techniques found images are used but in chigiri-e the torn paper itself is used to create images. 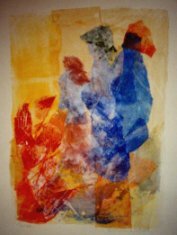 It has been called painting with paper.